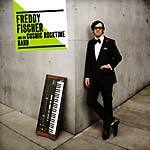 Gatefold LP version. The Kamikaze Queens are a saucy, tough and tantalizing female-fronted rock'n'roll performance band from Berlin, self-defined as "Berlin Punk Cabaret." With their second full-length record Automatic Life, the Queens take their original one-of-a-kind show on the road with 14 new tracks -- once again showing their many colors and musical influences in an explosive package of punk, garage, swing, burlesque, tales of night life, sea creatures, and good times gone bad. Don't let the upright-bass fool you, 'cause this ain't no rockabilly. 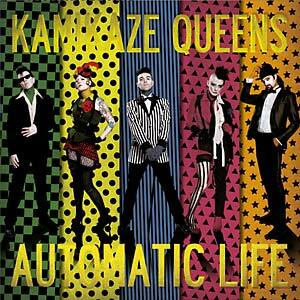 Kamikaze Queens are a wild, mis-behavin' mix; kickin', screamin' and rockin' out of this world. 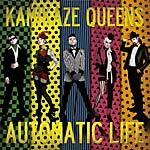 Automatic Life embodies the breadth of style that the Kamikaze Queens deliver, from a 24-hour Southern stomper at the "Tastee 29" to the dark and mysterious call of "Night Life." "Snagged On My Stiletto" is a cocktail of switchblade cool and punk attitude. Strap in for a night of breaking hearts and raging. "Good Times" is the hit that's engine don't run on gasoline. It's got all the lust, glamour, broken glass, bloody knees, booze and heartache that leaves you torn and frayed -- but comin' back for more. The story twists and dives deep into the sea with "Sweet Geraldine" and "I Was A Teenage Mermaid." They tell the tale of the mermaid Geraldine who has to leave everything she knows to follow her nagging curiosity and her rebellious spirit. Though her family might kill her, she's drawn to the rough and tumble, whores and trannies, punks and freaks that await her on land. Add to that a little John Waters-esque absurdity with a '60s dance-craze number, "Do The Crab" -- which is actually the first song Tex Morton ever wrote the music AND lyrics to -- and you're hooked, line and sinker. Joined by special guests on horns, singing saw and cello, as well as guest vocals, kazoos and whistles, Kamikaze Queens take a whole new approach to rock'n'roll.